Otitis media is the most frequent diagnosis recorded for children who visit physicians for illness. Approximately one-third of all children have more than three ear infections during the first three years of life. This results in 30 million doctor visits per year. Otitis media is also the most common cause of hearing loss in children. The outer ear meaning the part of the ear you can see on the side of the head plus the ear canal leading down to the ear drum. The middle ear: the eardrum and ear bones (ossicles), plus the air spaces behind the ear drum and in the mastoid cavities (vulnerable to air pressure). The inner ear: the area that contains the nerve endings for the organs of hearing and balance (equilibrium). The best way to define otitis media is to look at what the words mean. They are made up of three parts: ot- meaning “ear,” -itis meaning “inflammation,” and media meaning “middle,” or more exactly, “middle ear”: So, otitis media means “inflammation of the middle ear.” The inflammation occurs as a result of a middle ear infection. It can occur in one or both ears. Yes, it is serious because of the hearing loss it creates, and such hearing loss may impair the child’s learning capacity and even delay his speech development. It is also serious because it can cause a severe earache and because the infection can spread to nearby structures in the head, especially the mastoid. However, otitis media is not a big deal if it is treated promptly and efficiently, and the hearing can almost always be restored to normal. Thus, it is imperative to recognize the symptoms of otitis media and to get medical attention from the start. How Does the Middle Ear Function? The middle ear is a pea-sized, air-filled cavity separated from the outer ear by the paper-thin eardrum. Attached to the eardrum are three tiny ear bones (see diagram). When sound waves strike the eardrum, it vibrates and sets the bones into motion that is transmitted to the inner ear, which generates nerve impulses that are sent to the brain. A healthy middle ear must contain air at the same atmospheric pressure as outside of the ear, so all these structures can vibrate freely. Air enters the middle ear through a narrow tube called the Eustachian tube, which passes from the back of the nose up into the ear. When you yawn or swallow and hear a pop (or click) in your ear, which means your eustachian tube has just sent a tiny little bubble of air up into your middle ear to equalize the air pressure. This happens automatically over 1,000 times a day. Acute otitis media is caused by bacteria (or viruses) that enter from the nose or throat and ascend the eustachian tube to reach the middle ear. This occurs when the eustachian tube is not functioning properly, often because it is inflamed from a cold, sinus or throat infection, or an allergy attack. Infection in the middle ear causes an earache, a red, inflamed eardrum, and a buildup of pus and mucus behind the eardrum. Sometimes the eardrum ruptures and pus drains out of the ear. But more commonly, the pus and mucus remain in the middle ear because a swollen, inflamed eustachian tube cannot open up to let it drain naturally. This is called middle ear fluid or effusion or serous otitis media, and it often becomes chronic, that is, it can last for weeks, months or even years after the acute, painful part or the infection is over. Furthermore, it makes the child subject to frequent recurrences of the acute infection. What Are the Symptoms of Otitis Media? The most prominent symptom of acute otitis media is an earache, associated with a feeling of pressure and blockage in the ear. Children who cannot describe an earache may simply tug or rub the affected ear. Fever often accompanies an earache, especially in children. Hearing is usually muffled. This happens because the fluid in the middle ear prevents the eardrum (see diagram) from vibrating as it should. With proper treatment, this hearing loss is temporary; once the fluid drains, full hearing is restored. Without appropriate treatment, however, hearing loss may become chronic or permanent. During your child’s exam, the doctor will look inside his ears, using an instrument called an otoscope. With the otoscope inserted in the ear, the doctor can check for redness and fluid behind the eardrum and see if the eardrum moves in response to air pressure. A mobile (vibrating) eardrum is normal. Also, two tests may be performed to give the doctor information that cannot be learned through observation alone. One of these tests is an audiogram, in which tones are sounded at various pitches. An audiogram is used to measure how much hearing loss has occurred. The second test, called a tympanogram, measures the air pressure in the middle ear; this indicates how well the eustachian tube is functioning. These two tests help the doctor determine the severity of the problem and decide on a course of treatment. You can help the doctor by making sure your child remains quiet and still during the examination. Also, be sure to keep all follow-up appointments with your doctor to help ensure your child’s complete recovery. The doctor may also prescribe an antihistamine (especially if your child suffers from allergies) or a decongestant or a combination of these medicines when a cold or an allergy or both are present. The doctor may also recommend medication to relieve pain and reduce fever. Sometimes analgesic (pain-relieving) ear drops are prescribed. Call the doctor if you have any questions about any of your child’s medications or if symptoms do not improve. Most of the time, otitis media clears up with proper medication and home treatment. In many cases, however, further treatment may be recommended by your physician. For instance, an operation called a myringotomy might be recommended. This involves a small surgical incision (opening) into the eardrum to promote drainage of fluid and to relieve pain. The incision heals within a few days and creates practically no scarring or injury to the eardrum, In fact, the surgical opening often heals over before the ear infection has fully recovered and therefore fluid can reaccumulate. To overcome this problem, your physician can place a tiny hollow tube into an opening in the eardrum. The tube is placed to prevent the opening from closing prematurely. The tube, known as a pressure equalizing tube, helps by equalizing air pressure across the eardrum, preventing a vacuum from forming and accumulation of fluid in the middle ear. It improves the child’s hearing. The surgeon selects a ventilation tube for your child that will remain in place for as long as required for the middle ear infection to improve and for the eustachian tube to return to normal. This may require several weeks or even several months. During this time, you must take care to keep water out of the child’s ears because it could start an infection. But otherwise the tube causes no trouble at all, and you will probably notice a remarkable improvement in the child’s hearing and a welcome decrease in the frequency of ear infections. Otitis media may recur from time to time as a result of chronically infected adenoids and tonsils. 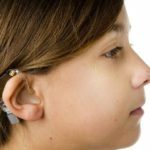 If this is found to be a recurring problem for your child, the doctor may recommend an operation to remove the adenoids, tonsils, or both, and this might be done at the same time he inserts the ventilation tubes into the eardrum. Otitis media is generally not dangerous if it is properly and promptly treated. With the help of your physician, you can help your child to feel and hear better very soon. Be sure to follow the treatment plan and see your physician until he tells you the condition is fully cured. Take the first step towards a healthier lifestyle. Make an appointment at Arkansas Center for Ear, Nose, Throat, and Allergy for an evaluation today. ©1996./10/50M American Academy of Otolaryngology-Head and Neck Surgery Inc. This leaflet is published as a public service. The material may be freely used for non-commercial purposes so long as attribution is given to the American Academy of Otolaryngology-Head and Neck Surgery Inc., One Prince Street, Alexandria, VA 22314-3357. For more information, visit our home page at http://www.entnet.org.